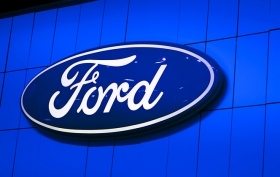 Ford Motor Co. plans to triple annual output of vehicles equipped with its EcoBoost engines built in Europe by 2015 as emission standards grow stricter in the region. The automaker said it would boost production to about 480,000 vehicles fitted with the engines from 141,000 in 2011. The automaker expects to double the number of models offering EcoBoost powerplants over the same period. To meet the goals, Ford has started production of the 1.0-liter EcoBoost engine at a new plant in Craiova, Romania. "Our EcoBoost plans are aggressive, but we believe as customers experience this engine family, they'll understand why," Sherif Marakby, powertrain director for Ford of Europe, said in a statement. Ford said EcoBoost engines can provide up to a 15 percent reduction in carbon dioxide emissions. In 2011, Ford built 141,000 vehicles with EcoBoost engines. The automaker has made fuel economy the focus of its vehicle strategy as oil prices rise, and U.S. and European standards for fuel economy and emissions tighten. The EcoBoost engine range will play a key role in helping Ford meet those standards. Ford expects that by 2015, more than half of its cars sold in Europe will be equipped with EcoBoost engines. Ford plans to produce more than 1.3 million EcoBoost engines for the European market from 2012-2015. More than half of them, 800,000, will be outfitted with the 1.0-liter engine built in Romania and, Cologne, Germany. Other options are a 1.6-liter variant and a 2.0-liter engine. The automaker has said it plans to produce as many as 1.5 million EcoBoost engines globally by 2013 for use in a variety of models. Ford also said it plans to double the number of models in Europe available with EcoBoost engines to 10 from five by 2015. The company has already introduced the 1.0-liter EcoBoost engine in the Focus and will offer it in the C-Max and B-Max minivans later this year. Ford of Europe will produce an additional 800,000 EcoBoost engines for markets outside Europe during 2015, up from 90,000 last year, the automaker said on Thursday. Production of the 1.0-liter EcoBoost engines began at Ford's engine plant in Cologne in November. The 1.6-liter version is built in Bridgend, Wales, and the 2.0-liter EcoBoost engines are produced in Valencia, Spain. The Bridgend and Valencia plants also build the 1.6-liter and 2.0 liter EcoBoost engines for the North American market. The two engines will be offered on both the 2013 Escape crossover, on sale later this spring, and the Fusion mid-sized sedan, on sale this autumn in North America. EcoBoost engines, which feature turbocharging and direct injection, are designed to deliver horsepower and torque comparable to larger displacement, naturally aspirated engines, along with better fuel efficiency and lower greenhouse gas emissions. The European Union wants emissions from new cars to fall, on average, to 130 grams of CO2 per kilometer by 2015. That would be nearly a 20 percent reduction from the EU's 2006 target of 161.3 grams.